Our twice monthly playtests continue. It’s been a while since we wrote a report, but here’s one for 5 April 2018, which was held from 6.30pm in Against the Grain on Wexford Street. Paddy has made an odd hidden-identities game where players cannot be sure of the identity they have. It’s a little bit like One Night Ultimate Werewolf, but with more interesting things going on under the bonnet, including a very interesting I-split-you-choose mechanic. I played this two weeks ago with four players and had a blast. This time, Paddy tried the game with six players and a couple of changes to player abilities. It didn’t go as smoothly but I suppose that’s the point of playtesting! One of the new abilities was named after me, so it stung a little to see it not work very well. What are you trying to say about me, Paddy?! For the past six months or so, I’ve been very enamoured by the idea of roll-and-write games – having bits of paper that you scribble on and then throw away afterwards feels very punk to me. And I’m totally punk! Anyway, Roll and Rail has players rolling dice to build little bits of railway, in order to connect up the different stations on their sheet of paper. This was the first playtest and showed that there is something interesting in the bones of the game – I already have ideas for a bunch of changes that are needed. I’d heard about Ethan’s police-procedural cooperative deckbuilder a few weeks back, so was excited to finally see it hit the table. It has occult mysteries and cops beating up criminals – pretty fun! The theme is carried really well in the cards and mechanics. I think this game is going to be fantastic a few revisions from now. Our biggest concerns at the moment all seemed to be about usability – cards that were hard to read, text that was hard to parse, some key-words that were wrecking my head up until the very end. I’m a little jealous that I didn’t invent this one! Keiron is a relative newcomer to the Celtic Cardboard playtests, though he’s been making games for a while. He has a knack for making games with really simple rules and really interesting interactions and puzzly-bits. His rail game was no different – it was a pick-up-and-deliver game, but played on such a tight map that players were always running into each other. This was my first time playing Paddy’s hidden-identities game, and it was a mixed table between new players and people who had played the previous version. While playing it I felt like the players with experience had a huge advantage, but then another new player managed to win at the end. So who knows, maybe I just had some bad instincts for it. I honestly don’t have much in the way of feedback for it yet, I think I need a couple more games to try out some lines of play before I can really say anything constructive. Fortunately, it is both entertaining and quick, so I look forward to further testing. A fun medium-weight roll and write from Robin of building a train network. The primary issue I think we identified was that the ‘special’ pieces of track (3- and 4-way intersections and the like, as opposed to just straights and turns) were probably overcosted for what they got you. One thing that I think is very encouraging is that the end of game scores were quite close but the patterns of tracks we laid out were quite varied despite that fact that we were all attempting to score the same objectives. Different strategies were effective, and I definitely saw ways by the end of the game I could improve my play in future games to be even more efficient with building my little penciled in railway. Another train themed game, Meeple Metro is a much more directly competitive game than Roll and Rail as players seek to pick up and deliver a limited pool of passengers around the board. I think with this game Keiran has stolen my place as the person who brings the nicest looking prototypes to the meet up. All the pieces were 3D printed, with your engine adding on extra cars that the custom meeples socket in to as you buy upgrades over the course of the game. Opportunities to be cut-throat were rare but quite damaging and the visual and tactile experience of the engines, cars, and meeples was excellent. Play length was maybe a little long, but that should be an easy fix. A co-op deckbuilder of small town police trying to fight off occult horrors while also managing the day to day demands of their citizens. This was pretty much a pure mechanics playtest for me; in later versions the game should have an interesting narrative to each case but at this session it was just a matter of surviving a few turns to make sure the core mechanics held up. And they (mostly) did! Robin did spot that I had managed to include a card that was unplayable by a specific character; so that was a pretty big oversight. One thing that was encouraging to see was that players seemed to identify with the characters they were playing, even though at this stage they lacked any art and were simply different colored poker chips that moved around the table. I got a lot of usability feedback, especially relating to terminology. Another problem, as noted by Robin, was legibility. I had decided to use a different card template than the one I usually use for prototyping out of a desire to shake things up and it was just not as good. Proof that the old adage holds true: if it ain’t broke, don’t fix it! I’m currently working on a game (nameless and themeless for now!) that has “I split, you choose” as the main mechanic. I’d never actually played one of these games before, and decided I wanted to try make one for myself. This was it’s second test (it’s first one being 2 weeks ago). 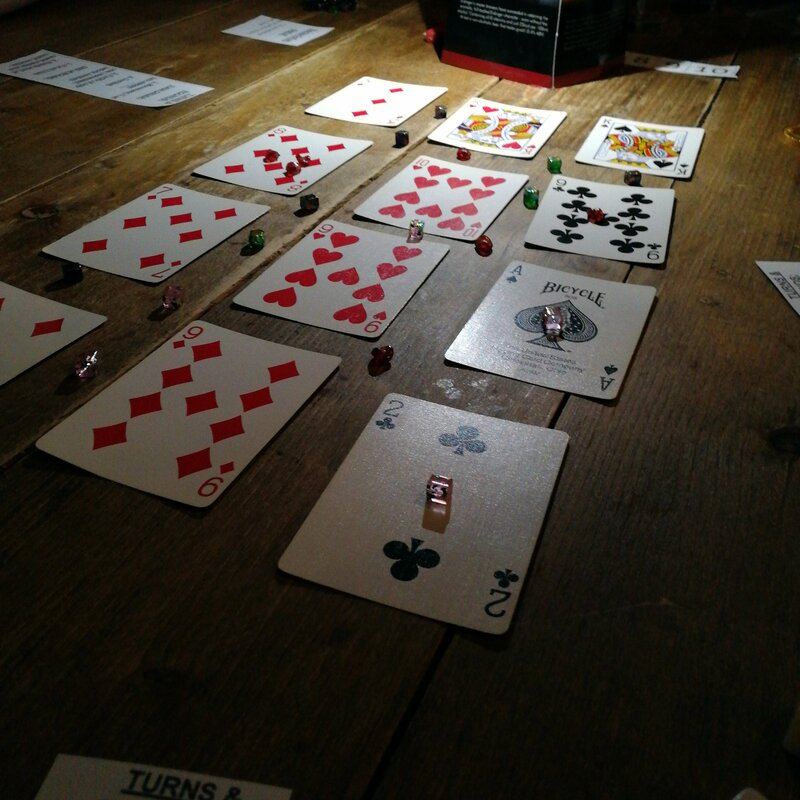 In the game an amount of money is drawn from a bag, and split between cards in the middle of the table, which trigger abilities. The biggest change since the last playtest was some additional cards and abilities, which allowed the game to go up to 6 players. Unfortunately the new powers didn’t go too well, and expanding the game to such a large number of players slowed things down too much, and had too much information hidden from the players. Despite my ambition to make this play well with larger numbers, I don’t think the design is heading that way at the moment. Brian, Ciara and Eoin over at Decking Awesome Game are a fountain of creativity, always bringing something new and innovative. On Thursday they brought a new game that they’ve dubbed “chaotic worker placement”. The concept it simple: what happens in a worker placement game when the workers don’t do exactly what you expect them to? This is going to be a tricky balancing act, based on this playtest. At the moment, the game is quite strategic involving the gathering and use of different resources. But the workers not always doing what you want prevents you from being too strategic. Balancing those two aspects of the game is the biggest issue they face right now. This was Glen’s first time at the meet up, and he introduced us to his game. It’s a neat little area control game where enemy units can assimilate your units if they die in combat. It’s a really interesting idea, but it lead to a bit of a runaway leader problem. There were also some ability cards in there that needed to be rebalanced, but that’s not a big deal. Potentially this game could be either a light, family game or something a bit more strategic, and I think Glen needs to decide which direction he wants to take it. There’s definitely potential there, and it was great to have a new face bringing some new ideas. I’d also like to say that the table we were sitting at provided some nice light for dramatic photos! I was dying from jetlag and missed this event, sorry everyone! But I will be working on a GDC round up (the cause of the jetlag) which we’ll have ready soon.